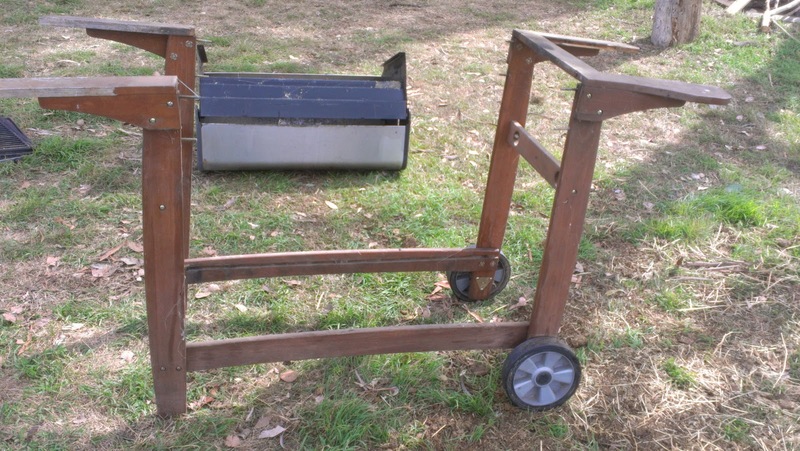 Today I had the brilliant idea of making a chook tractor (portable cook pen) out of an old abandoned BBQ. This beast on wheels was left abandoned at Highfield. I suspect it no longer worked, in any case we were not going to revive it as a BBQ. 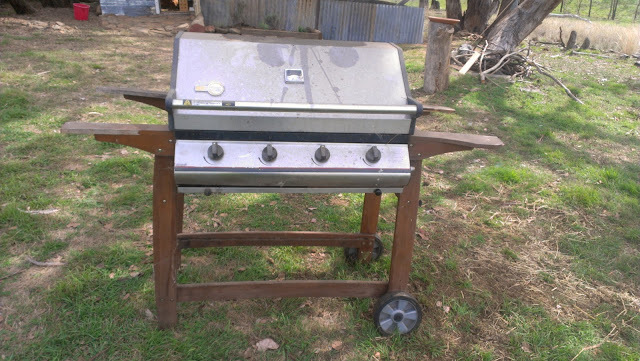 I actually don't see the point of gas BBQs. I like the smokey wood / coal smell that a real BBQ imparts and so to me this beast was just junk or fit for recycling and the idea was to recycle it into a chook tractor. 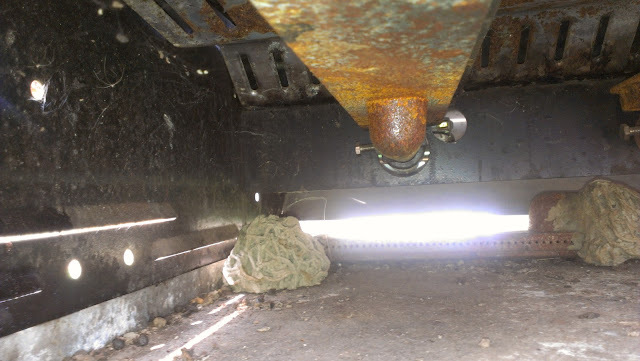 The idea was to remove the BBQ bit and to enclose the frame with weld mesh. I could roll it out to the bit of grass I wanted munched and pop the girls in and they could do their thing, scratching and eating. Disassembly was going well and soon, with a bit of fiddling, I got the beast down to the frame - the bit that I wanted. I even cut out and fitted a bit of weld mesh to the top. So what went wrong you ask? Well I took a look at the space under the frame and tried to imagine a little chooky or two inside it trying to scratch away... behind a bit of weld mesh... I decided that there was barely room for one chooky to turn around, let alone the tribe of 4 lasses. It didn't seem like the right thing to do to lock one girlie into a space that was so small to go to work for me so I decided to abandon the idea. But there was an unexpected outcome. In detaching the BBQ bit I found that there were loads of mud wasp nests attached - 7 in total. I was grateful it was not hatching season. 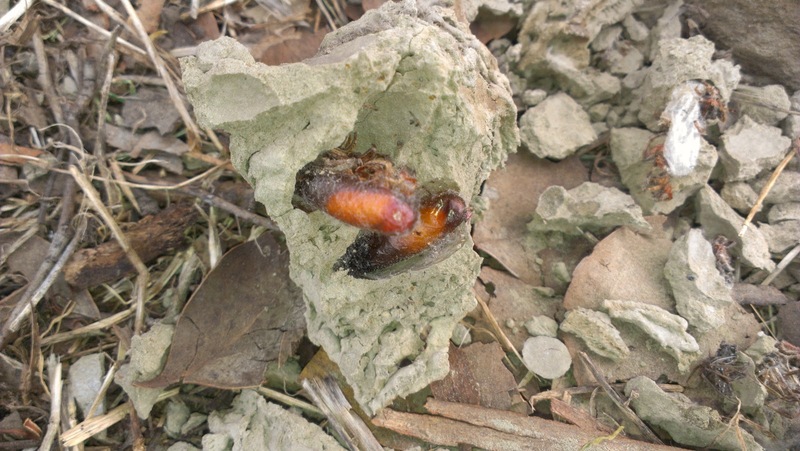 Inside the hard mud encrustations were not only the larvae of the mud wasp, but also loads of dead spiders, stuffed in each cell presumably to feed the baby mud wasp. 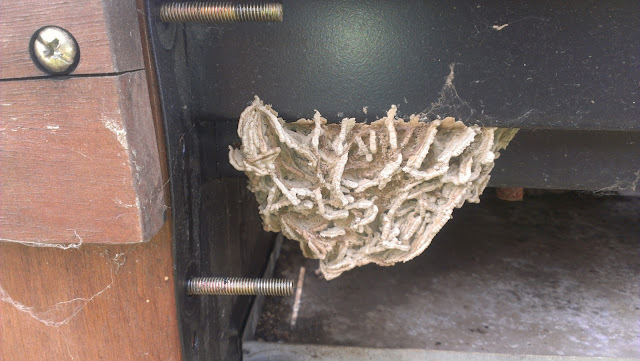 Earlier in the year we had watched a mud wasp build its nest on the front verandah of the house and we had watched as they stuffed fresh spiders inside the egg cavity. Here on the right is the huge nest we watched being built on the wall of the house under the protection of the verandah. 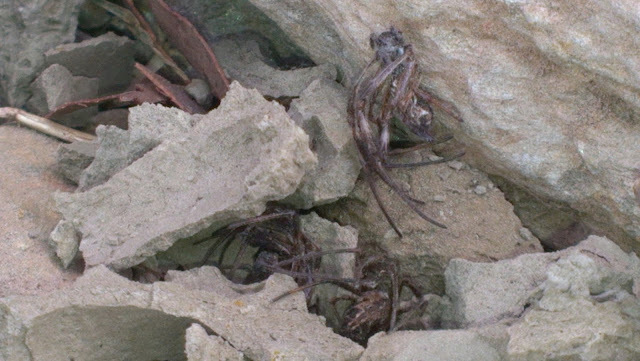 It along with other smaller nests are being left to do their thing. Take a look at the three-coloured mud. As there are loads of these nests all over the property, including ones we have left on the verandah, I didn't feel too bad about breaking into the BBQ ones and feeding the chooks. Well, the girlies had a ball, some seemed to prefer the larvae, some preferred the more numerous spiders. I had a ball too watching their delight in their new strange food source. I wish I could show you some photos of the happy lasses, but so keen and eager were they to dive in and run off with their loot as I was breaking open the cases, it was impossible to get a snap. You will just have to believe me. My mood, previously stormy at a wasted day, improved markedly! I have decided that there should be a new aphorism for these sort of situations. It might go something like this, "When you have had enough, go feed a chook". 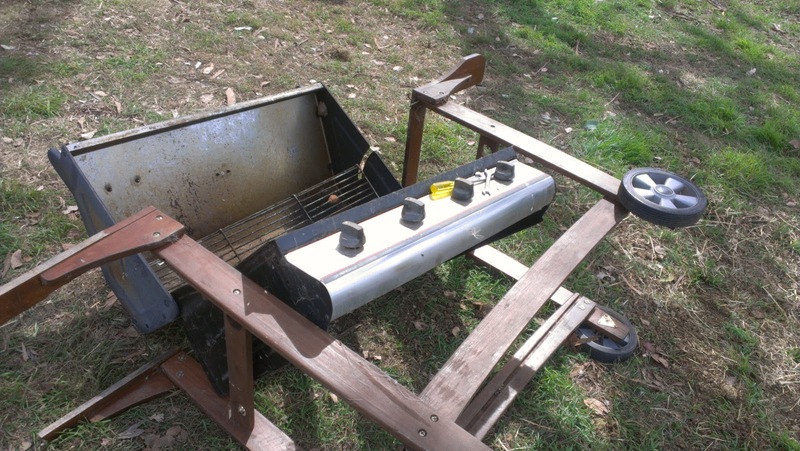 Anyone want a dead gas BBQ? 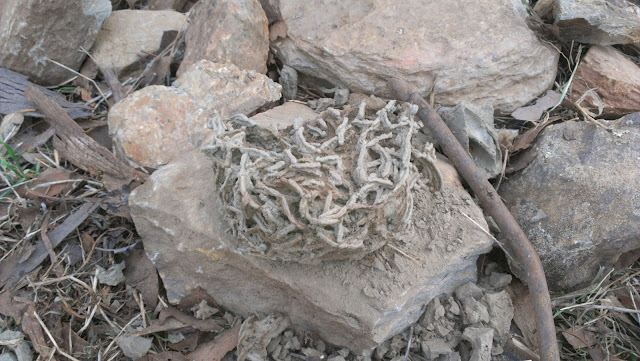 You can add educating me about what a wasp nest looks like to your list of achievements for the day. I don't know what I thought one would look like but not necessarily like that. Interesting aren't they? 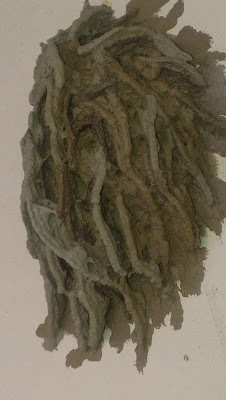 We also have paper wasps nests around the house. Hehe. I know what you mean. You can't maintain a bad mood and watch chickens (or in my case, ducks) simultaneously. They're hilarious. I love feeding mine dandelion and watching them with two ducks having one leaf each and pulling them away from each other... simple pleasures. I am so enjoying the chooky girls. They are starting to come when I call them and are prepared to be much closer to me each day. I love watching them. I'm not quite sure I "got" the tractor idea anyway, but aren't wasps nests fascinating. How many wasps will hatch from the one on your verandah? I guess it's not right by a door?! Well, it is actually by the door. We reckon about 6-8 cells are in the big one pictured. That's about how many round chambers we saw made. As for the chook tractor, I was going to enclose the whole frame with wire, wheel it to where I wanted the girls to plough for me knowing that they were both protected and also where I wanted them to be but this frame was just not good / big enough. I will be making a chook tractor but a much bigger one. 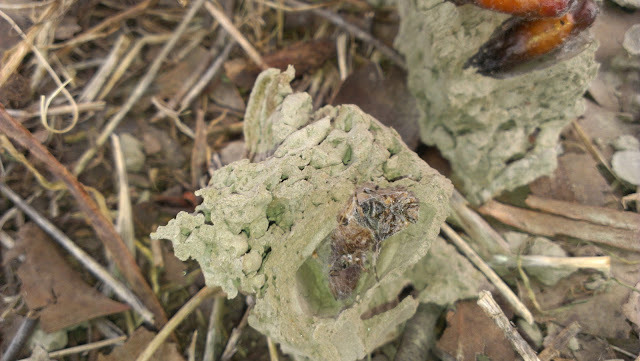 Wasp nests - amazing. Great pics.